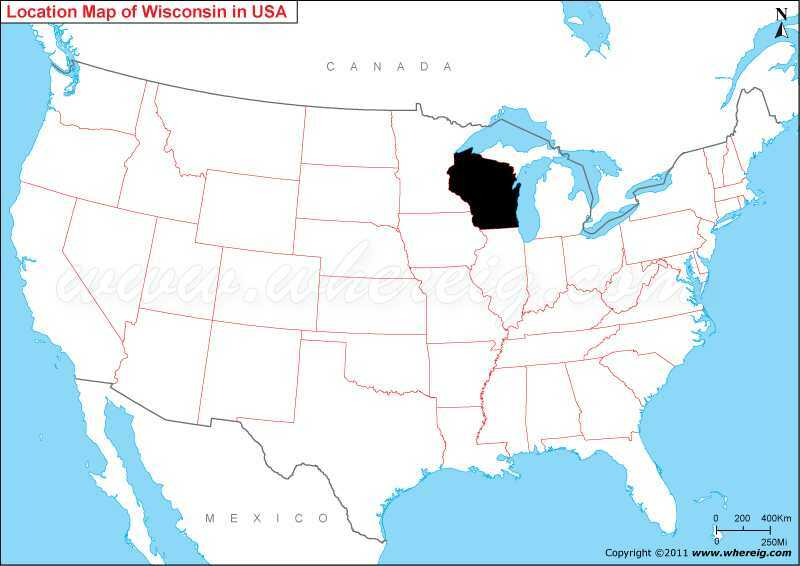 Map showing location of Wisconsin on the US map. As shown in the given Wisconsin location map that Wisconsin is located in the north part of the United States; however, it is considered as the part of the Midwest. Wisconsin shares its border with Minnesota in the west, Iowa in the south-west, Illinois in the south, Michigan in the northeast. Besides, it also shares water areas with Great Lakes Superior and Michigan. The capital city of Wisconsin is Madison; however, the largest city is Milwaukee. The climate type of Wisconsin is humid continental. The state name 'Wisconsin’ is derived from the name of Wisconsin River. In fact, this name was first used by one of the Algonquian speaking American Indian groups. Moreover, the state is one of the most visited tourist destinations that receives thousands of tourists every year. Milwaukee is one of the favorite tourist cities of Wisconsin.